As Xi Jinping lands in India tomorrow, the vexed boundary dispute will figure in his talks with Narendra Modi. New Delhi needs to seriously study the way Vladimir Putin handled the Sino-Russian border question. Old Chinese maps had a warped sense of reality, especially when it came to the size and reach of the Middle Kingdom. I have even seen a map that shows Kamachatka and Chukotka as parts of China, let alone places like Khabarovsk and Vladivostok. The map in question was printed at the peak of the Cultural Revolution, when a sense of insanity swept across the country. Post-reforms China still harbours a grudge towards what it calls “Unequal Treaties” but economics and trade trump territorial ambitions, especially when it comes to dealing with powerful countries. Beijing is even willing to stress on its ‘harmony despite differences’ principle in border disputes and diplomatic relations. After a misadventure with Soviet soldiers on the other side of the Amur in the 1970s, China decided that there was no way that it would ever get back territories lost to Tsarist Russia and that it needed to work on a compromise to settle the boundary question with its northern neighbour. After more than ten years of negotiations, Beijing and Moscow engaged in a give and take in which the former surrendered claims to vast swathes of Russian territory. In 2004, Russian President Vladimir Putin agreed to hand over Tarabarov Island and half of the Bolshoi Ussuriski Island on the Amur River to China as a final settlement of the border dispute. There were some small protests in the Amur and Khabarovsk regions in Russia, but this was eventually accepted as fait accompli. The bone of contention between India and China is the latter’s refusal to recognise the McMahon Line, which was the border line agreed to by Britain and Tibet, as part of the 1914 Simla Accord. Many commentators have argued that China does not recognise the McMahon line, but the fact is Beijing accepted this line as the boundary with Myanmar. There is no reason why this should not apply with India. The few lunatics propagating war in both countries should understand that a war between the two countries would not be restricted to the border areas in 1962 and would destroy decades of economic progress made by India and China and set both countries behind by a century. 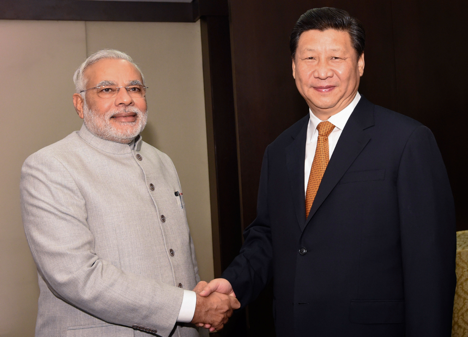 India and China need to make the same kind of compromise that the latter made with Russia. For India, if that means surrendering claims on territory, that doesn’t house a single Indian citizen, and is basically a frozen wasteland, then so be it. Beijing, conscious of its economy, is well aware that it cannot take Arunachal Pradesh by force, and in the spirit of give and take will have to renounce its claims on the Indian state, the way it did with what was then Burma. Give and take helped Russia and China settle their boundary question and will do the same for the Sino-Indian dispute. Sino-Indian friendship and cooperation is the foundation on which the 21st Century will belong to Asia. Several European countries nursed grudges over borders and territories lost in the continent’s long and bloody wars, but six decades after the devastating Second World War, borders have vanished across most of Europe. Germans can go to Alsace and Lorraine without blinking and Hungarians can visit Transylvania without any kind of permissions. If Asia’s giants can move towards a similar rapprochement, the day may not be far when exotic cities like Kashgar and spiritual lands like Tibet become open without restrictions to Indian citizens. In fact, we may one day even be able to have a common and free economic area stretching across India and China into Central Asia and Russia. Of course, peace and stability in such a large area will make countries that thrive off wars in distant lands uneasy. The Eurasian landmass, of which India and China form a big share, is faced with clear choices in 2014. Put aside differences, work together and bring about economic prosperity for the masses, or let an external power manipulate the situation and create chaos to further its own interests.